Celebrating the first anniversary of its scooter, TVS today launched Jupiter Special Edition which will be available in limited numbers. 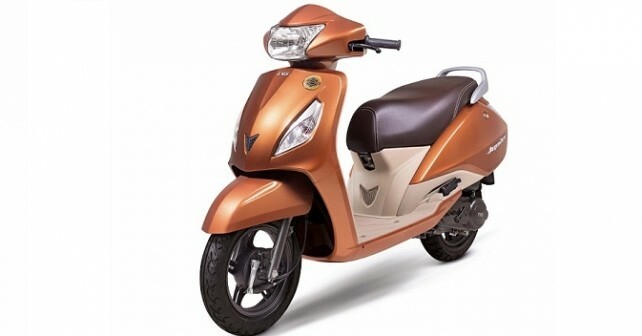 Equipped with new features and available in a new colour, the new TVS Jupiter Special Edition was launched today by the Chennai based two-wheeler manufacturer. The new variant will be available only in the Stallion Brown shade with Beige panels. TVS is also offering a special ‘Dura Cool’ seat in the new Edition. This new seat keeps the temperature almost 10 degrees lesser than usual when parked under the direct sunlight. After having a successful one year, the scooter managed to sell almost 3 lakh units in India in its first year. The limited edition TVS Jupiter has been priced at Rs. 48,925 (ex-showroom, Delhi) which is Rs. 2,000 more than the standard offering and the new scooter is currently available in TVS dealerships across the country. As for the engine, the special edition packs the same single-cylinder, air cooled 110cc engine which delivers a maximum power of 7.9bhp at 7,500 rpm.